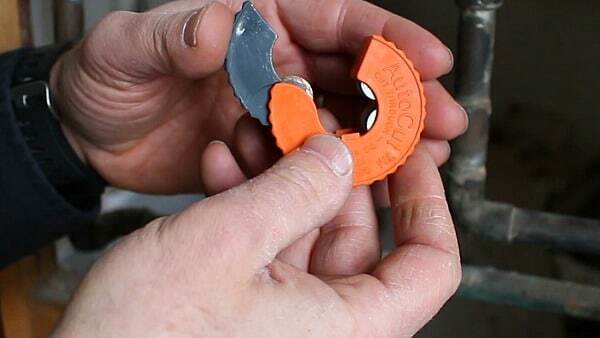 Today you’ll learn how to install a water shut off valve…and do it in record time. If there’s ever a time to freak out it’s during a water leak. They lead to damaged drywall, mold, etc etc. Nasty stuff can happen as a result. 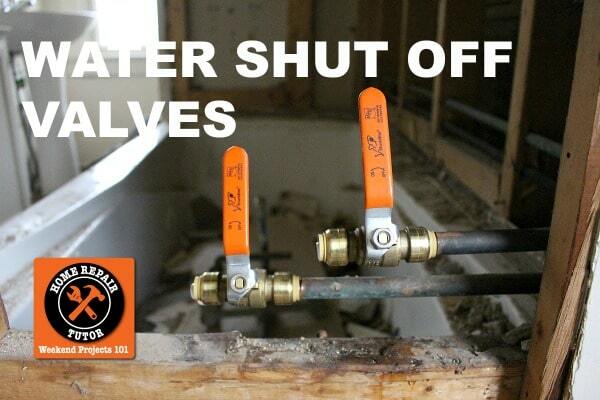 Shut off valves can help prevent this from happening. I’m currently remodeling a bathroom in one of my rentals and the shower needed a shut off valve. So I wanted to share how we did that project. You’ll also save about $100-$125 by not calling a someone else to do this for you!! I LOVE SharkBites shut off valves! They simply push on and that’s it. There are a few steps but not many. By the way, this old bathroom I’m working on…I’m gonna show you all the ins and outs of the remodel. First step, turn off the water to your house. Usually the water main will be in a basement or garage. Then drain your home at the lowest point. Usually this is a laundry tub, outdoor spigot, or kitchen faucet. Plan where you’ll place the shut off valve. 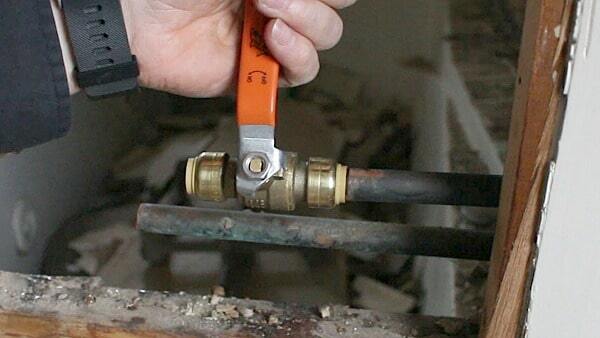 Then cut copper pipe with an AutoCut tool. I love this little tool. 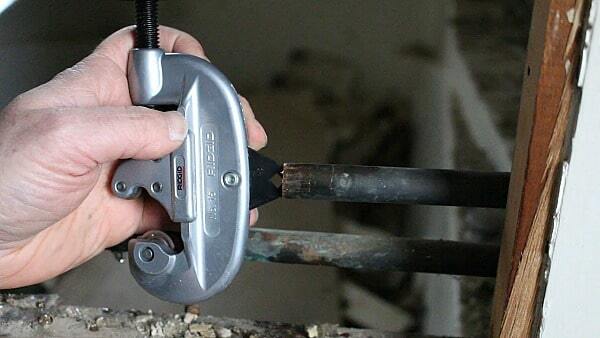 It’s great for tight spaces and slices through copper in 7-10 revolutions. Deburr the inside of your copper pipe. When you cut copper pipes you create a little lip. This needs to be removed otherwise the SharkBite fitting may not work. Use either the SharkBite Depth Tool or a Ridgid No. 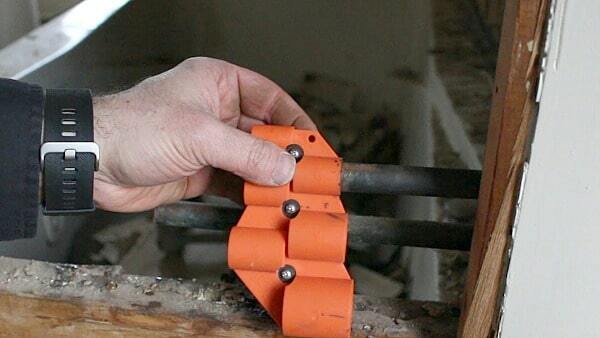 15 pipe cutter or a utility knife. Emery cloth also is great for cleaning the first 1 inch. 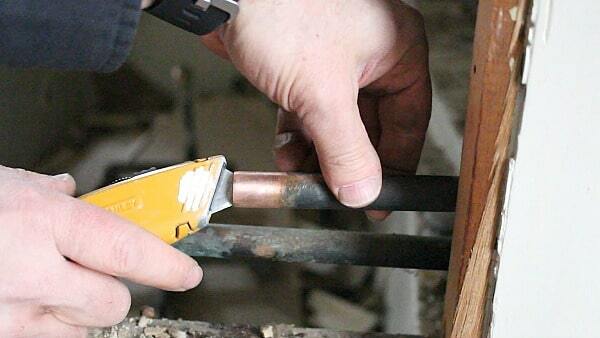 Place the SharkBite depth tool on copper pipe and make a mark 1 inch from the edge. Now all you have to do is slide the SharkBite water shut off valve onto the pipe. The final step is to test your work by slowly turning the water back on. If all is good, you should have no leaks. If for some reason you do have a leak, you can turn the water off and slide the SharkBite off the pipe. I show you how to do this in my video…by the way, the house in the video was my very first rental ever. We’ve had it for 12 years and it’s been a journey, let me tell you, haha. SharkBites are great for showers with access or vanities or toilets. 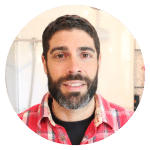 Also, if you need to replace a shower diverter we have a great tutorial showing how to that project. This is so great! I am getting ready to put shut off valves in both bathrooms and this would make it so easy, even I could do it. Thank you. I prefer to sweat pipes. I guess I am old school. But there are some tight spaces where I would consider using it where the flame of the torch could start a fire. Do they also make connectors? I hate pin hole leaks. They are usually in the hardest places to get to. Awesome idea. Renovating a basement complete with bathroom. Could use these tools during the process. Really enjoy your videos and have found numerous hints and tips. Keep up the good work. I could use the tool give away because we retired and moved into an older home for financial reasons, we need to renovate the home I have started the renovations. All of the taps and shut offs leak and I am trying to repair as I go. By the way I am 71 yrs young and still renovating, many large jobs as I said the whole house needs renovations. I want to upgrade the main bathroom and install a basement bathroom for convenience. I was a home inspector …. fully qualified RHI in Ontario before I retired, I find your videos very helpful. I always research my projects before I start, you can never be over prepared. I am sort of my neighborhood handy man and I believe that kit would be a great help. Thanks for your DIY video’s they have been helpful to me. Hi Jeff, You made is sound so easy which it actually is and I realized it after I changed one for the first time. The key challenge for me the first time at my home was the mineral deposits around the old valve made the removal a challenge. And the valve was inside the bathroom cabinet which made it all the more inconvenient. After changing a few at my home, with all the required confidence I ventured to change one at one of my rental homes. Though all my prior experience came by handy, I had a new challenge. Even though the main water supply valve to the home, was fully closed, water kept oozing out when I unscrewed the old shut off valve. I had also help the taps open to drain out but this oozing would’nt stop. I then had to hurry up with changing the shut off valve while mopping up the small puddles. Touching or doing anything to a water pipe has always scared me but this video made me felt so at ease. This tutorial would come in handy since I need to tackle this at my tenant’s bathroom. Could use this kit when remodeling my daughter’s bathroom in her condo. Have used Sharkbite fitting before and love them. 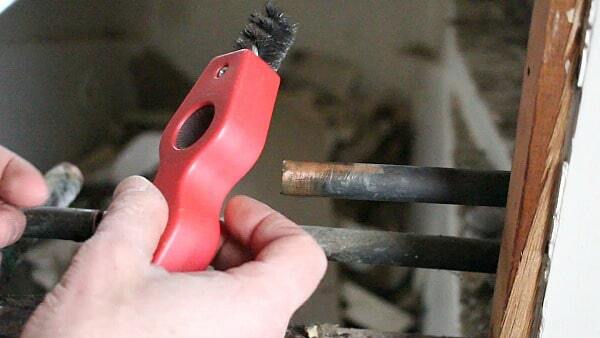 I haven’t seen that cutting tool before. I have a small cutting tool I use, but this looks much better. I panicked when I had my last leak and the plumber took advantage of the situation. I could sure use your kit for my bathroom. None of the shut off valves work in my house. All need replacing. Going to try replacing them after watching your very helpful video. Thank you. another great video jeff. I can use a few of these. on my water heater, my main shut off valve. under all my sinks. keep up the great work. H E L P !!!!!!!!!!!!!! Getting ready to do a bathroom remodel, followed by adding an additional half bath in the basement. This kit will be a great help. I would do this myself. 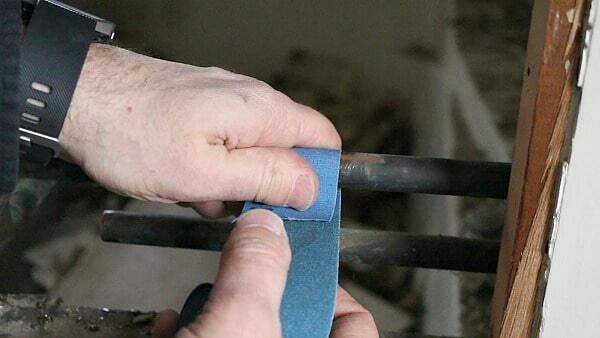 It looks to be easier than soldering copper pipe. Great video, love the shark bite products, could use the kit for the toolbox. Have a rental unit and repair business too.where the kit would be useful. Getting ready to add a wet bar to basement and will need these for sure. Thanks for the chance to win them. There are some gate valves on the galvanized pipe that are turning blue. I fear just touching them will cause them to leak for a while until crusted over with time again? Is brass gates to galvanized even ok or will that cause electrolysis reaction? Will have to use local turn-offs like you show, Jeff. Then what to do with the old valves? If you have an older home with galvanized pipes, I suggest hiring a plumber to do the switchout. Unscrewing the old valve and screwing on a new one may seem easy enough. But if the pipe is rusted internally or the threads are rotted, this “simple” plumbing job can turn into a plumbing nightmare. If your home is plumbed with PEX or plastic pipe, these instructions don’t apply. I’m replacing the plumbing under my kitchen sink, because I apparently had a leak and the cabinet floor boards have rotted because of a leak under my sink. I am also installing SharkBites instead of trying to sweat copper pipes . I have been told that SharkBites are the way to go. I am also doing some plumbing in my shower so I want to put some shut off valves in the bathroom so that I can work on my shower if needed. I would live to win new tools for the Shark Bite- so I can install some new cut offs. Thanks Sharon, we already chose a winner. But you should check out SharkBites for your next project. Well worth it. I need to place a shutoff valve under my kitchen sink for the dishwasher supply line, It is a solid copper line, Can I attach the weaved flexible supply line to the other end, does it have threads for that?